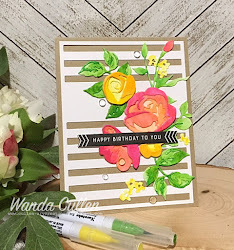 My day off is whizzing by too quickly, but I started it off by creating this card for the Free 4 All Challenge on SCS to "get krafty" and stamp on kraft! 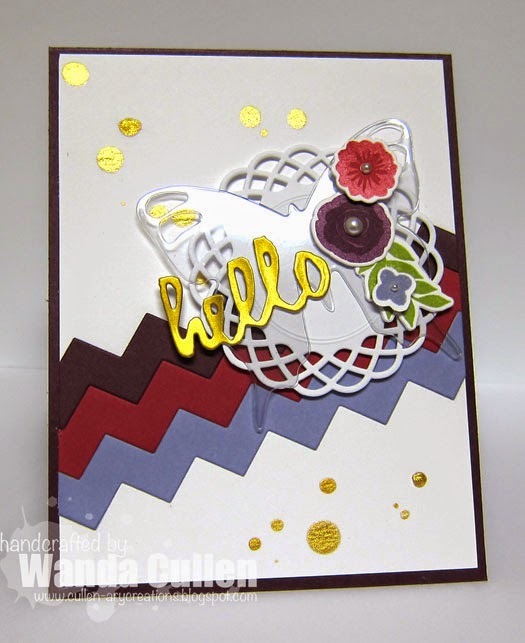 This is a sneak peek of a new stamp set (basket and sentiment) and dies (eggs) that will be part of the new release this Sunday at Our Daily Bread Designs. After stamping with Coconut Husk ink (WPlus9) on kraft, I sponged the edges with Crumb Cake ink. The basket was fussy cut and popped with foam tape, then filled with die cut eggs using papers from Sunshine in My Soul 6x6 pack by Glitz. 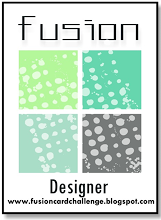 The background has a subtle embossed impression using ODBD Faithful Fish Pattern die and debosser plate. The daffodils were colored with Copics and a portion of the corner image was cut apart and added for a pop of color. STAMPS: Basket of Blessings (ODBD), Daffodil Corner (ODBD). 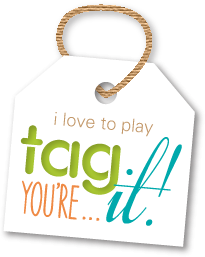 ACCESSORIES: Mini Tag Dies (ODBD), Eggs Dies (ODBD), Sheer ribbon (SU - retired), Jute twine. 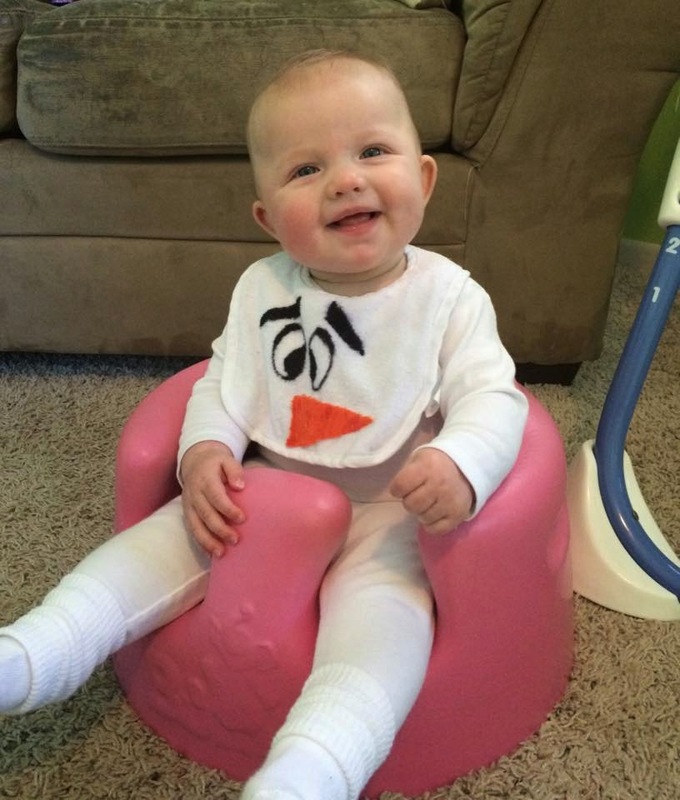 Have to share with you the cutest Olaf ever! Happy Wednesday everyone! 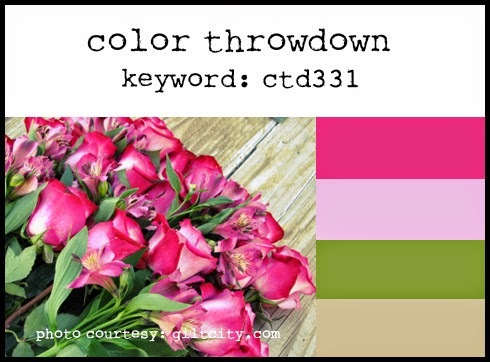 Check out the GORGEOUS colors Jodi has chosen for this week's Color Throwdown Challenge! 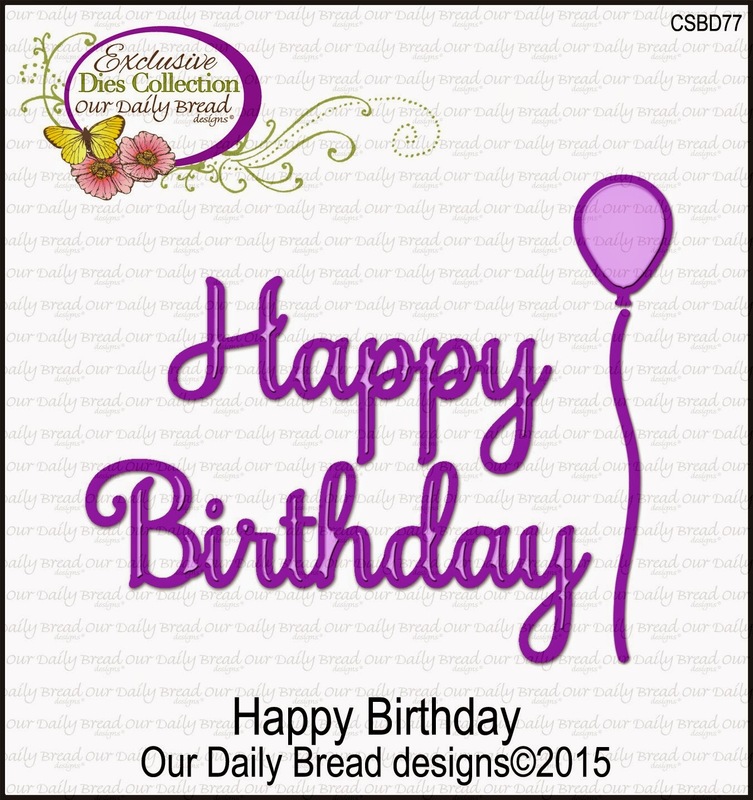 One of my co-workers has a mother celebrating her 95th birthday this month and I was asked to create a card for her! I knew these colors would work perfectly for the occasion! I started with sponging the background with a new Pure Color dye ink - Beanstalk - by WPlus9 and a chevron pattern stencil (Simon Says Stamp). Just love that their ink pads give such smooth, vibrant coverage when stamped! The flowers were inked with another of their new colors - Little Piggy - and was stamped off once for the 1st step. I ran the die cut heart through my crimper then sponged Color Box white pigment ink on the edges. The numbers are glittery black stickers. STAMPS: Rosy Posy, Rosy Posy Step 2, Wet Paint - all by PTI. PAPER: White and Kraft by PTI. INK: Beanstalk and Little Piggy by WPlus9; Versamark; ColorBox Frost White. ACCESSORIES: Rosy Posy and Wet Paint dies by PTI; Jotted Heart die by Verve; Crimper, Sequins by Avery Elle; Paper doily; White thread. Hello everyone! I am happy to say it's the last Mojo Monday Challenge of February - my least favorite month of the year! The weather has been brutal with the coldest temps we've had in VA in MANY years! Came home from work last Thursday night and it was 2 degrees - not counting the wind chill factor! 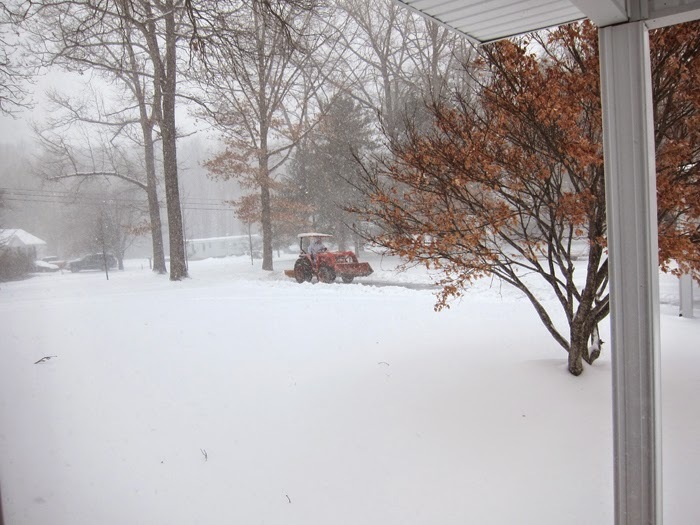 Saturday, we got a foot of snow dumped on us! So, I'm not sad that this month will soon be history. It's time for a tall and skinny creation this week, so I went with a 3 1/2" x 5 1/2" card. 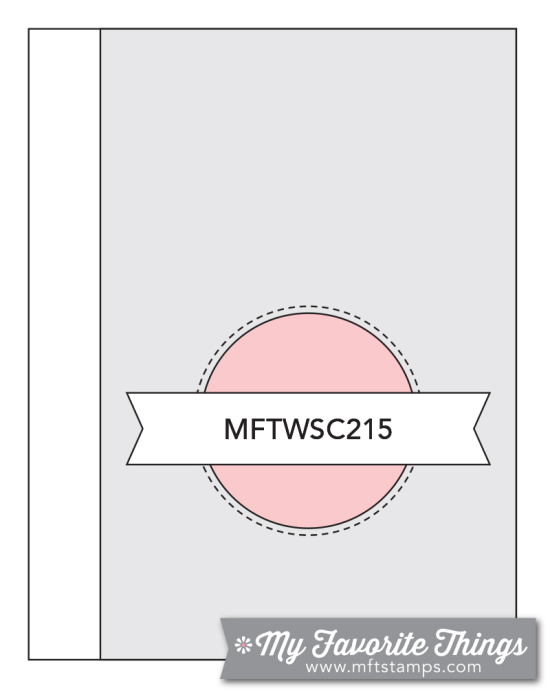 I recently ordered this paper pack from MME that has the prettiest peachy tones paired with black and gold. I'm a happy girl with gold making a comeback in papercrafting! These poppies haven't seen ink in awhile, so thought they'd work perfectly with these elegant papers. I added black enamel accents to the centers and fussy cut the leaves after stamping with Beanstalk dye ink by WPlus9. 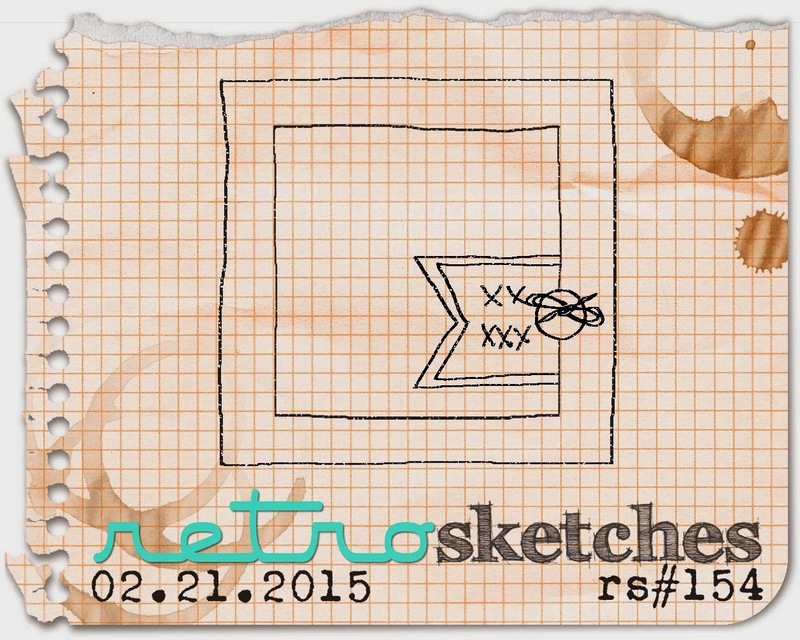 I liked that the paper design on the black panel fit the sketch so perfectly! For more inspiration, be sure to check out the other mojomakers' creations by clicking on their blog links below OR you can go to the Mojo Monday blog and the first 8 thumbnails will be the mojomakers' cards. 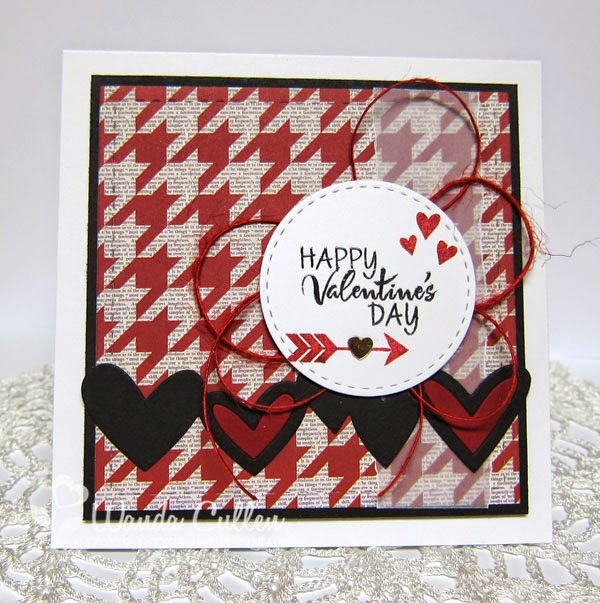 ACCESSORIES: Build A Poppy dies by Verve, Black enamel accents, Fishtail Flags Die-Namics by MFT, Square punch to create the ends of the sentiment flag. 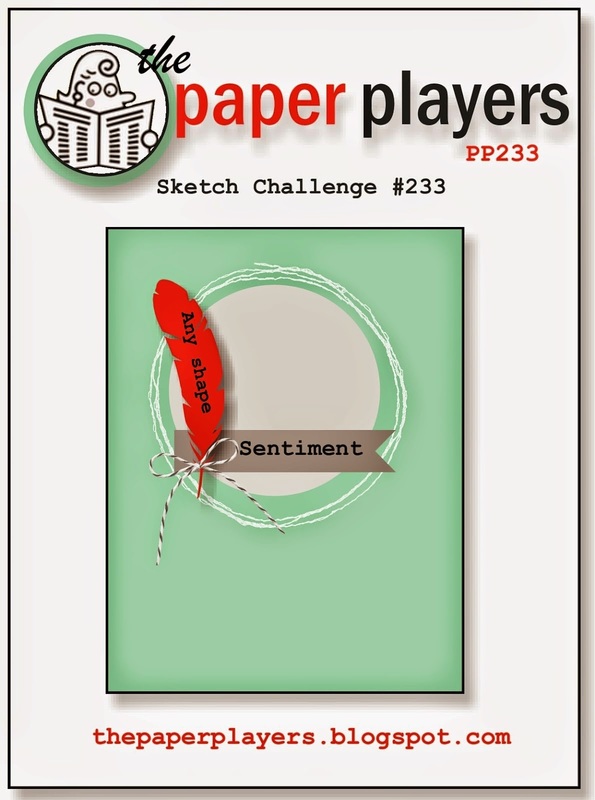 It's been awhile since I've played along with The Paper Players Sketch Challenge but I couldn't resist the current sketch which was perfect to pair up with SCS CAS Challenge to think spring! After getting another foot of snow dumped on us yesterday, I am VERY ready to get into spring mode! 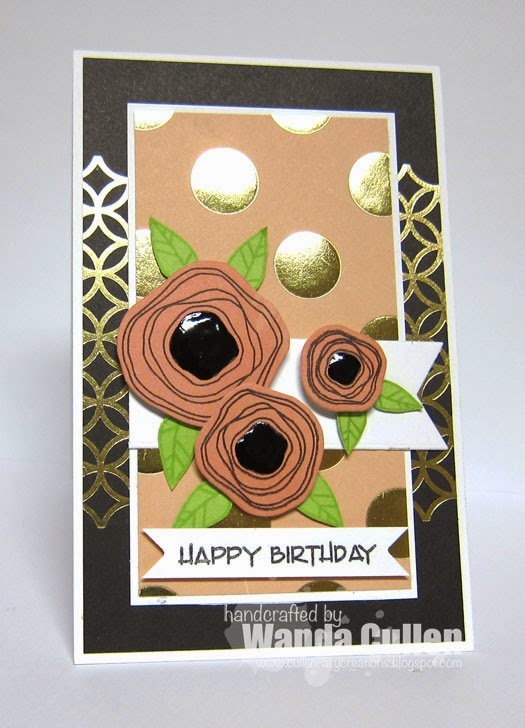 After gold embossing the circle scribble, I layered up some florals and accented with sequins. 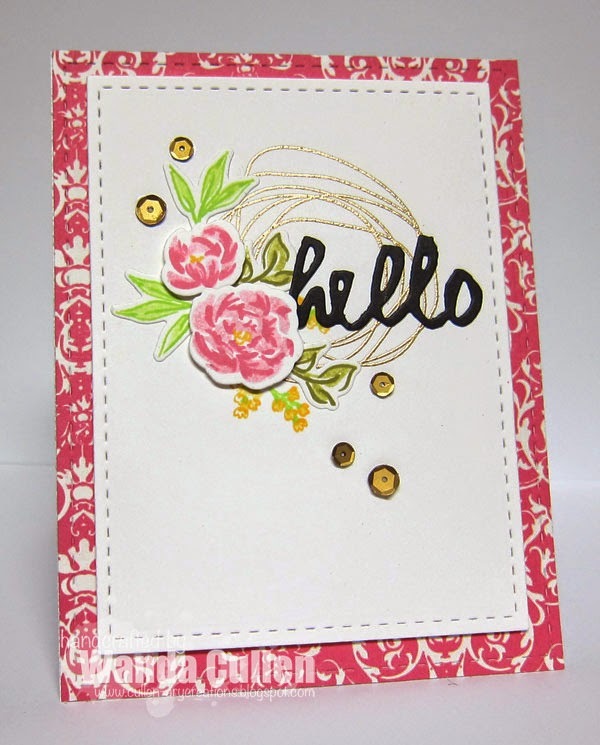 STAMPS: Pretty Little Peonies (WPlus9), Circle Scribbles (Papertrey Ink). 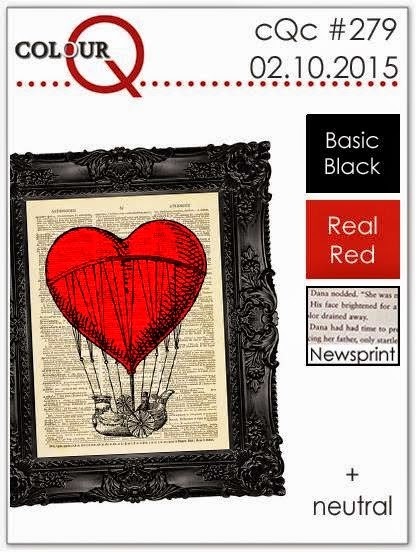 PAPER: True Friends 6x6 pad by Carta Bella, White (PTI). INK: Little Piggy, Wild Mango, Beanstalk, Appletini by WPlus9. 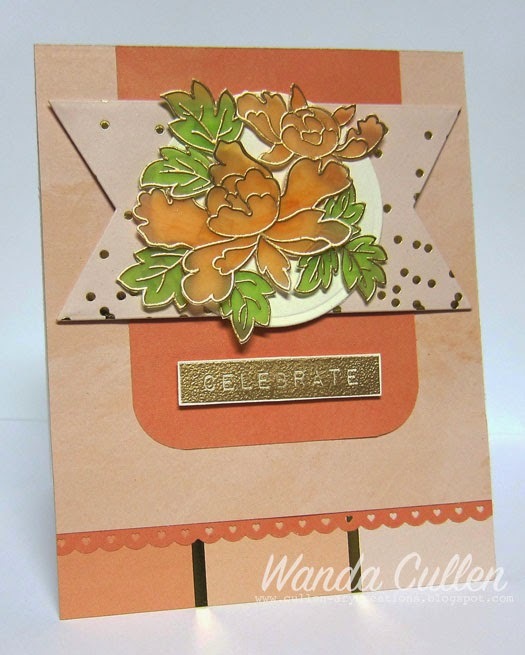 ACCESSORIES: Pretty Little Peonies dies (WPlus9), Gold sequins by Avery Elle, Wet Paint die by PTI. butterfly creations, so that's what I went with. Papers are from an old Stella and Rose "Mabel" pad by MME and layered on a white 5 1/2" square CS base. 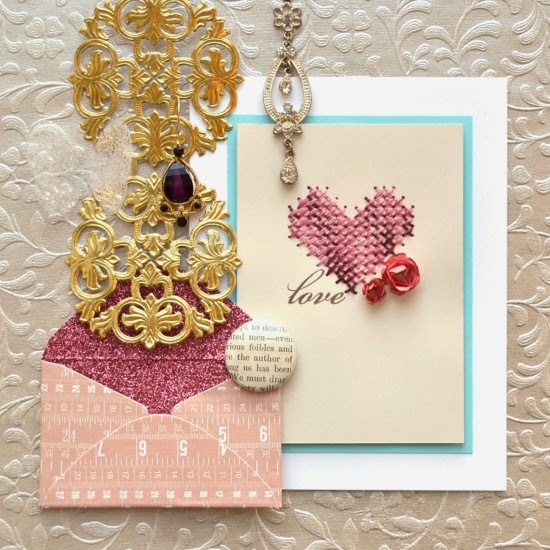 ACCESSORIES: Awesome word die, stitched butterfly dies by Lil Inker Designs; Fishtail Flags and Button Die-Namics by MFT; Jute twine; Adhesive rhinestones. Hope everyone is staying warm in their corner of the world! My corner has warmed up into the balmy 20's (a welcome change from single digit temps with wind chill below zero!) and it's snowing like crazy outside! While my husband is outside pushing snow with the tractor, I'm warm and cozy in my stamp room...loving my new MISTI that came in the mail yesterday! This really, really is the Most Incredible Stamp Tool Invented! Iliana from My Sweet Petunia is the inventor and it's genius!! 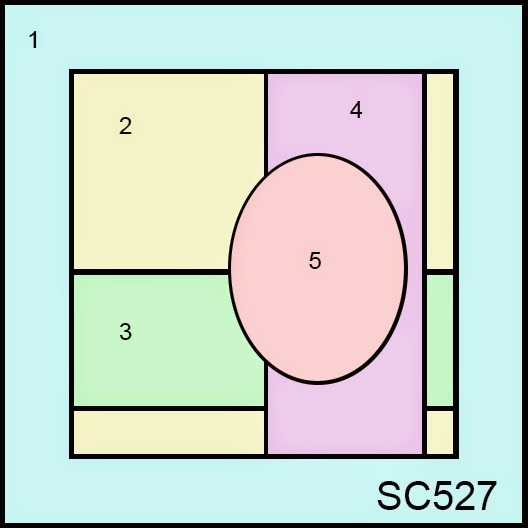 Here's a link to a YouTube video describing it. It is well worth the money if you're undecided. 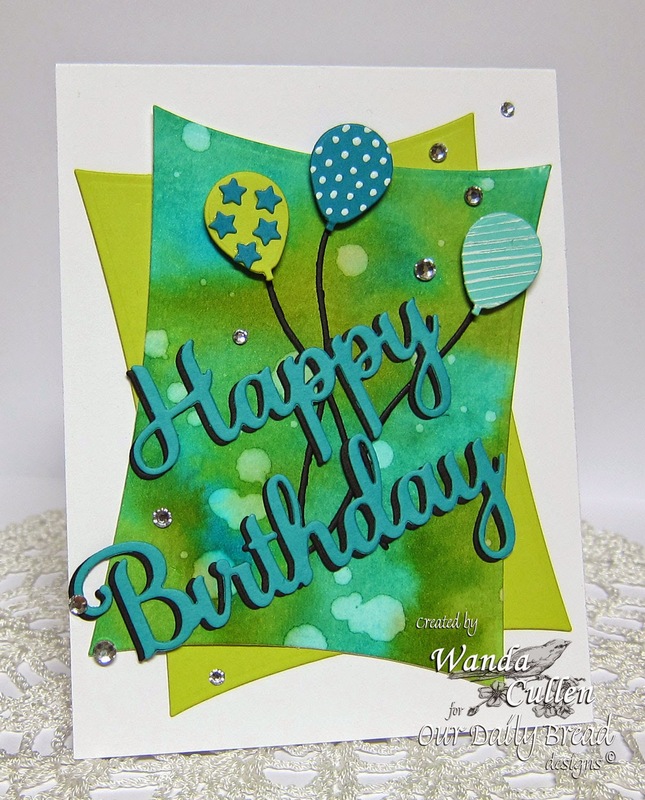 I used it to position my large sentiment stamp for my card for the MFT Wednesday Sketch Challenge. If you don't get a stamp inked up well the first time...no worries. 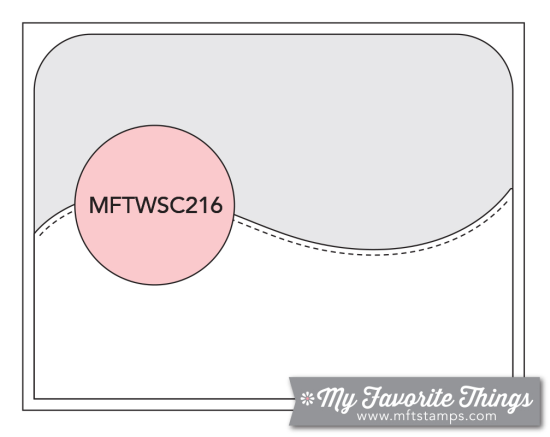 You just open up the MISTI and re-ink it and the placement will be perfect when you restamp it! I tried it first with a large background stamp and yup...I didn't have it inked up evenly when I stamped it the first time. I added more ink and bingo...perfect results! No more wasting paper for me! 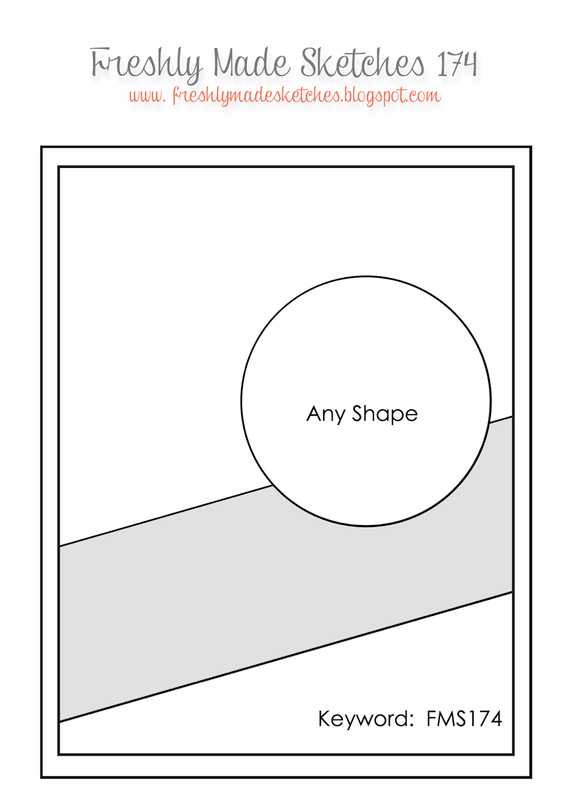 PAPER: Classique: Beauty by Authentique, New Leaf (MFT), Old Olive (SU), Basic Gray (SU). 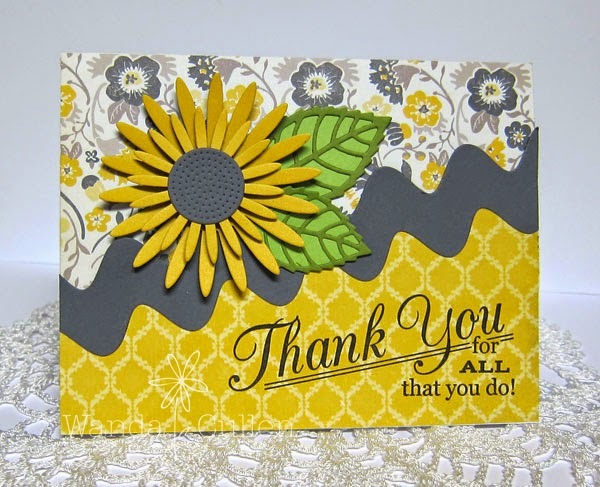 ACCESSORIES: Gerbera Daisy, Layered Leaves and Rickrack Border Die-Namics by MFT. set to feature on my card. Using Peacock Feathers and Peeled Paint distress inks, I wet the watercolor cardstock then picked up the two colors from acrylic blocks and applied colors to the paper with a brush until I got a blend I liked. After it was dry, I tapped a wet brush over the BG to let water droplets create a "bleached" effect. I thought the sentiment would have more of a pop by shadowing a black layer behind it plus it adds dimension. I used a white gel pen to add stripes and dots to the balloons and the tiny stars are from ODBD Stars die set. You'll want to see more inspiring projects by the rest of the design team, so head over to the ODBD blog...OR...click on their links below. 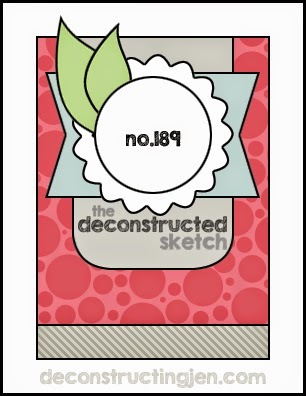 My card for the new Deconstructed Sketch Challenge and for Altenew's February Challenge to use gold and glitter! I thought the new Fancy That! 6x6 pad by My Mind's Eye would work well with the gold patterns. I gold embossed the flowers and leaves on vellum then colored underneath with Copic markers (YR02, YR04) then fussy cut and adhered with Kool Tak foam clear pads. Love this product as it doesn't show through vellum! STAMPS: Peony Scrolls (Altenew) & Label Love (Altenew). 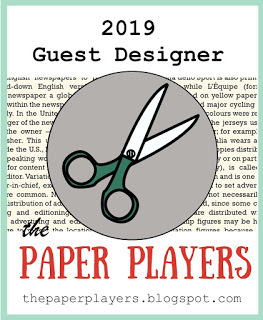 PAPER: Fancy That! (MME), Vintage Cream, Vellum. ACCESSORIES: Fishtail Flags Die-Namics (MFT), Corner chomper, Mini heart scallop border punch by Martha Stewart, Fine gold embossing powder, Circle Nestie. A quick CAS creation for the Colour Q challenge and Freshly Made Sketches. 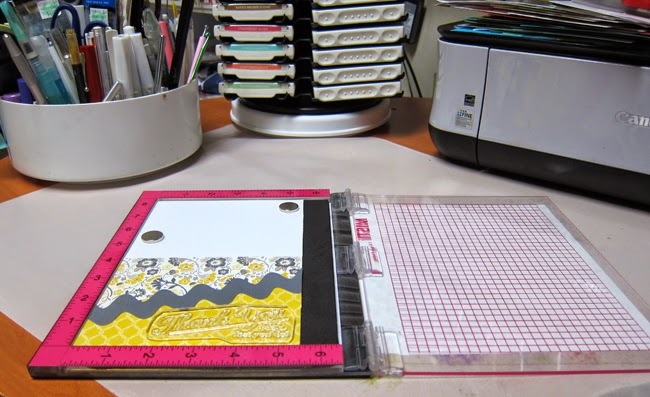 The bracelet in the photo inspired me to use these zig zag dies for the diagonal element. Some splattered gold shine by Heidi Swapp and a ghost butterfly shape layered over a doily served as the backdrop to a small group of floral dies and a die cut sentiment from metallic gold CS. STAMPS: Fresh Cut Florals (WPlus9). 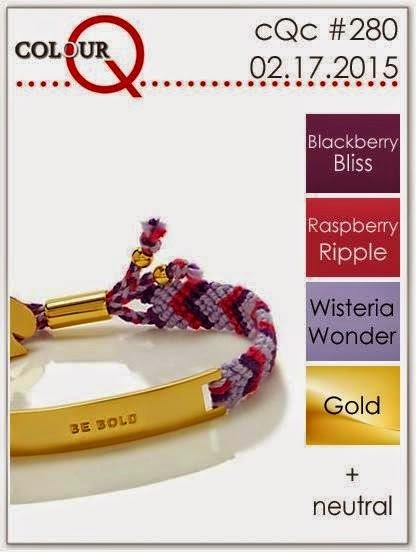 PAPER: Blackberry Bliss, Raspberry Ripple, Wisteria Wonder, Gold, White. INK: Blackberry Bliss, Raspberry Ripple, Wisteria wonder. ACCESSORIES: Doily by Martha Stewart, Gold shine and ghost shape by Heidi Swapp, Fresh Cut Florals dies by WPlus9, Adhesive pearls, Zigzag Die-Namics by MFT. 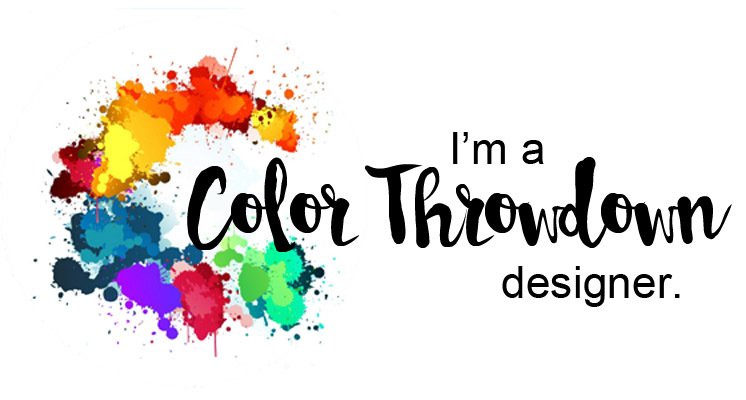 Are you ready for some awesome colors for this week's Color Throwdown Challenge? 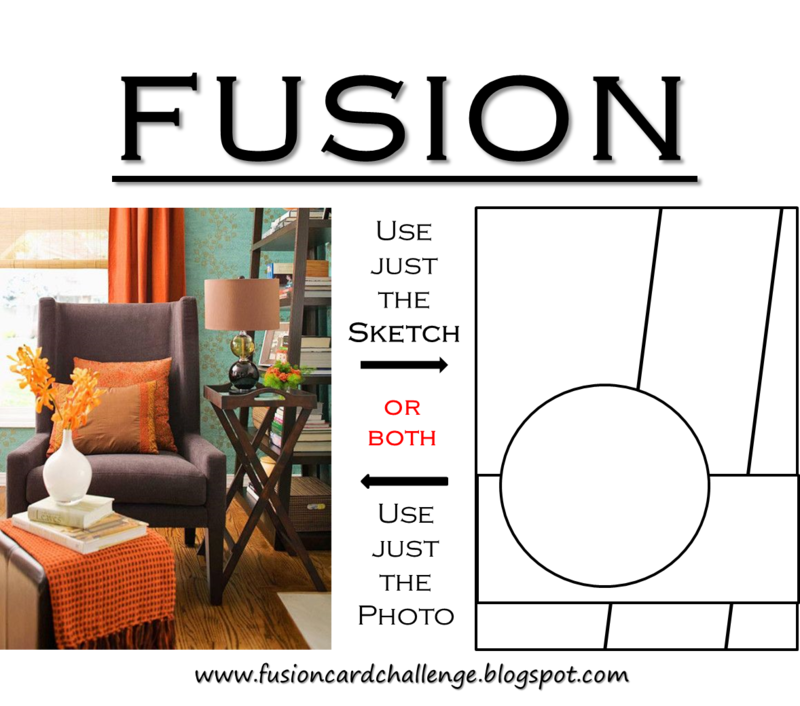 Check out Joan's fabulous inspiration photo with the absolute "WOW" design in the wall backdrop! The light and dark greens, orange and white are such a refreshing color combo and I couldn't resist playing with these WPlus9 florals again while it was snowing like crazy outdoors! defined enough with the 2 inks, so I took 2 Copic markers (G82 and G85) and lightly added some highlights. In hind sight, I wish I had stenciled a different pattern other than leaves. I really need to get out of the jungle with my backgrounds - lol! I then splattered some Heidi Swapp Gold Color shine over the panel. I used Leigh Penner's sketch for CAS(E) This Sketch #110. 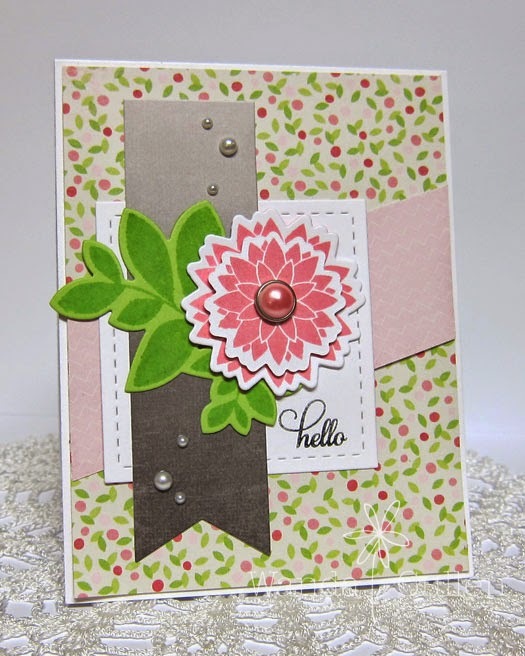 Congratulations to our guest star stamper this week - Amy White of White House Stamping! Hope to see YOU in the throwdown gallery! STAMPS: Pretty Peonies (WPlus9), Label Love (Altenew). PAPER: Fabrications 6x6 pad by Teresa Collins, White. INK: Beanstalk, Mojito, Wild Mango - WPlus9; Versafine Onyx Black. ACCESSORIES: Pretty Peonies dies (WPlus9); Heidi Swapp Gold Color Shine, Black thread. ...it's cold outside and it's snowy, but the sun is out and finally the wind has stopped howling! 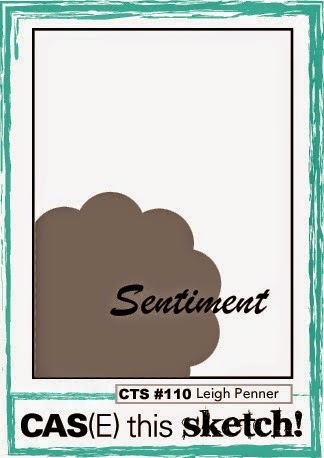 Between laundry loads, I sneaked in some time to create a card for today's Color Challenge on SCS and I also used the layout for the MFT Wednesday Sketch Challenge. I chose to use 3 out of Mary's 5 colors: Coastal Cabana, Hello Honey and Baked Brown Sugar and even went with the dessert option to create a baby card. 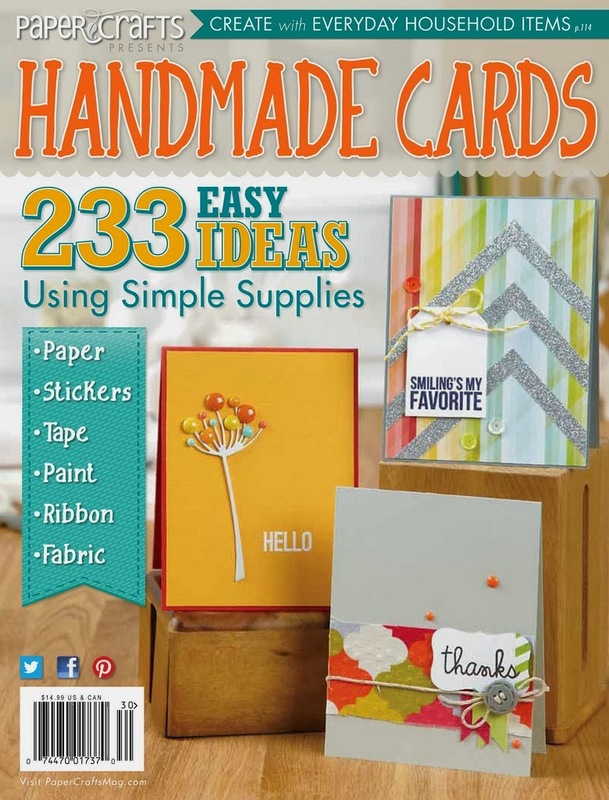 These MFT dies make it so quick and easy to make a no frills card! No stamping involved! PAPER: Fresh Prints paper stack by SU, Coastal Cabana, Hello Honey, Baked Brown Sugar, White. ACCESSORIES: Bib, baby sentiment, pin and duck Die-Namics by MFT. Shiver, shiver, shiver!!! It's Monday and it's beyond cold with below zero wind chill factor here in VA and 4-8 inches of snow predicted to fall today! I know that's nothing compared to the northeastern part of the states, but I've become wimpy in my old age - lol! It's my regular day off, so I'm hunkered down at home...hoping I don't have to venture out for anything. Enough about weather. Julee has another great sketch for the Mojo Monday challenge and I went with some springtime colors even though it feels like it will never get here. 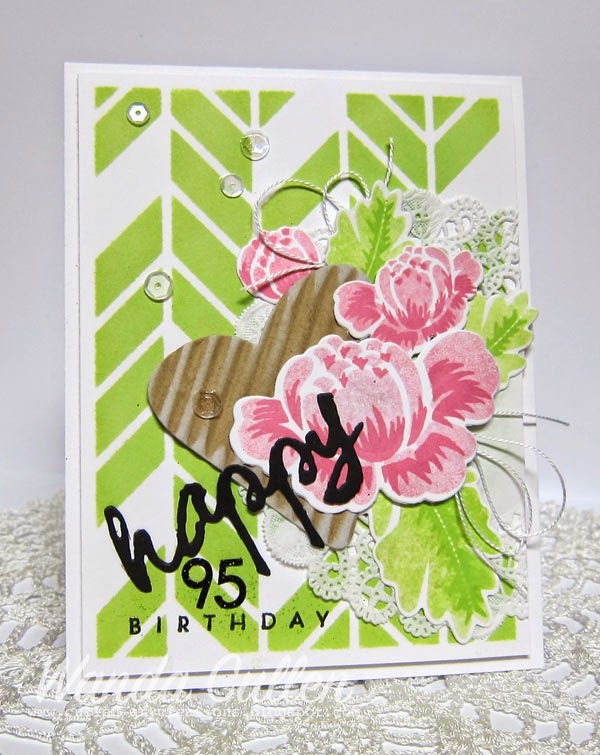 I used Little Piggy ink on white and Beanstalk on Sour Apple CS for the flowers and leaves. Love these Pure Color inks by WPlus9 because they give a smoother and less mottled coverage than my SU pads which I normally use for colors. STAMPS: Be Blessed (Verve) - flower; Bloom and Grow (Verve) - leaves; sentiment is a freebie stamp with a Verve order. 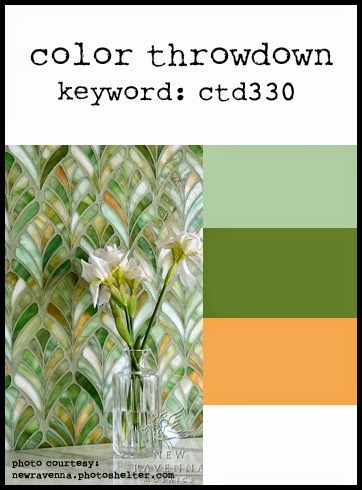 PAPER: Head Over Heels by Echo Park, Sour Apple by MFT, White (PTI). ACCESSORIES: Adhesive pearls; Fishtail Flags Die-Namics (MFT); Stitched square die by Lil Inker Designs; Petal Points and Elegant Leaves dies by Verve. It's that day when people are thinking of those they love and hopefully expressing it to them...not by big gifts, but by small, heart felt ways! 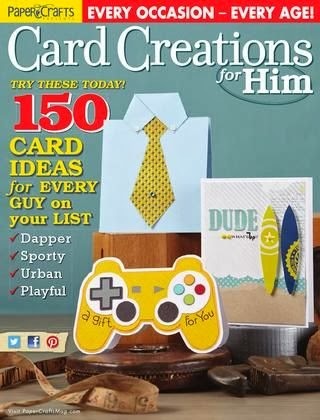 This is a last minute card I created for DH. It will accompany his favorite sour cream sugar cookies! :-) I started by using the Freshly Made Sketches challenge layout and layered up some Reverse Confetti elements over designer papers from Echo Park's Yours Truly 6x6 pad. I started this post Saturday morning...got sidetracked with getting ready for work and the day got away from me. It's now shortly after midnight and I'm winding down from a very stressful drive home from work. Wind blowing snow sideways in places and ice on the walks, parking lot and roads! Crept along going 25 and 30 MPH but made it home safely - PTL! The older I get, the more I hate driving in bad weather! 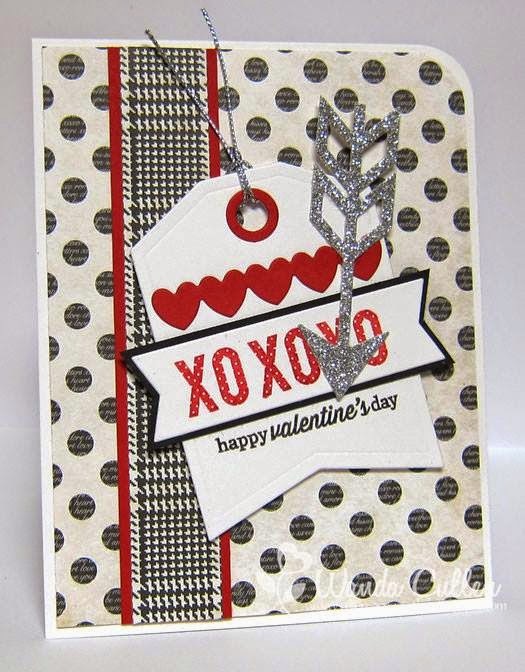 ACCESSORIES: Arrow, tag, heart border, and banner flag - Confetti Cuts dies by Reverse Confetti, Silver cording, Corner chomper. A quick post before heading off to work with a clean and simple masculine valentine! I knew I wanted to incorporate this heart border Die-Namics die by MFT, so went with some inlaid pieces of Cherry Cobbler CS against the black outline. sentiment from Verve's Love Notes set; the arrow is from Crushin' by Reverse Confetti. 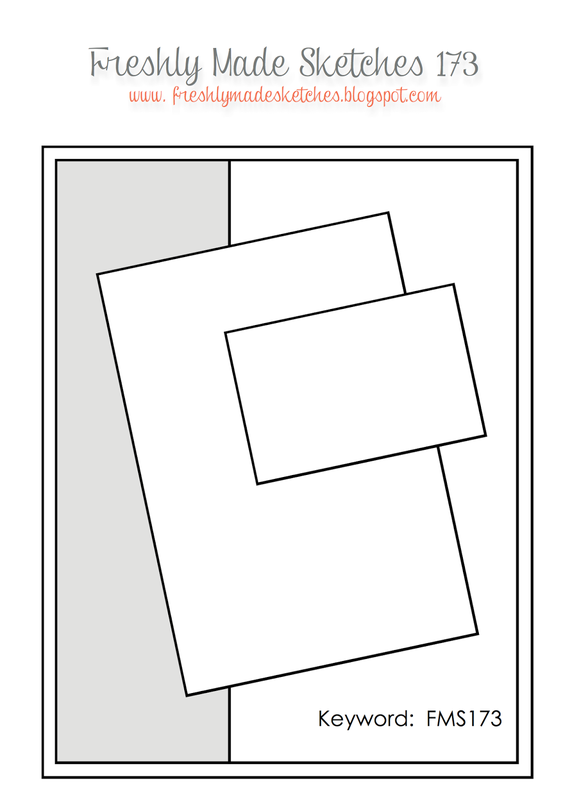 The vertical strip is a piece of vellum with torn edges. The shiny gold sequin heart doesn't show up well in the photo, but I wanted a wee bit of added sparkle and shine! To add some texture, I looped some red jute twine behind the popped sentiment circle. The finished card is 4 3/4" square. February Release Time at ODBD!